Looking for some sparkle this festive season? It’s a wise man who snaps up tickets to these three glittering exhibitions. As you lie awake tonight, trying to decide on those last-minute gifts you really should have bought by now — will it be Lynx for him and Chloé for her, or would they both prefer a Primark voucher? — distract yourself for a moment from these fierce seasonal anxieties by remembering once again the loftiness of their origins. You are putting yourself through all this, and frantically trying to decide what to give Kyle and Lola for Christmas, because of the famous gifts brought to Jesus by the three wise men from the east on the day of his birth. The first wise man, you will remember, brought gold, not because it cost so much, but because it had such a powerful symbolic meaning. Gold had traditionally been identified with the sun. The way it glowed and refused to tarnish endowed it with a magical reputation. When the wise man gave the baby Jesus a gift of gold, he was seeking to signal that Jesus himself was the harbinger of a new dawn: a new sunrise. The gold wasn’t just a present, it was also a prediction. The second wise man, as you also know, brought frankincense, which in its time was even more valuable than gold. Frankincense is made from the resin of the boswellia tree, which grows in Arabia and Somalia. Because of its sweet smell, it was used in perfumes and incense. Just about every ancient religion burned frankincense in its ceremonies. As its gorgeous aromas filled the air and drifted out into the cosmos, the incense-burners of the ancient world felt they were communicating with the gods. The third wise man brought myrrh, for glummer reasons. Myrrh is another resin from a Somalian tree. In ancient Egypt, it was used in the embalming of mummies. One intention of the gift of myrrh, therefore, was to predict Jesus’s death on the cross: to symbolise the momentous but wretched biblical truth that Jesus was born to die. None of which will make it easier for you to choose your own last-minute gifts. The fact that you are having to decide between an iPad Mini and a Sony Xbox because of these momentous events in Palestine more than 2,000 years ago will be a help to some, but a hindrance to most. In any case, gold, frankincense and myrrh are no longer realistic options. So, instead, I offer you gold, emeralds and pearls. Three fine shows examining each of these blingy delights have recently opened in London and will be there into 2014. All you need do is get your loved one a ticket for one of them, and that’s the pressie problem solved for another year. 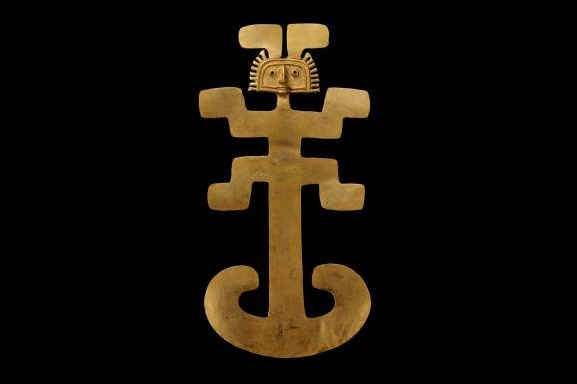 Beyond El Dorado: Power and Gold in Ancient Colombia, at the British Museum, is the gold-fest to end all gold-fests. Look to the left: gold. Look to the right: gold. Look ahead: gold. Although gold was valued by every ancient civilisation, its appeal was felt particularly powerfully in Latin America. And in the Andean stretches of what is now Colombia, its role in the culture of the Muisca people was ferociously important. Like most gold-lovers, I suspect, I had always believed El Dorado to be a place: a fabulous city of gold lost somewhere in the Amazonian jungle. But it wasn’t a place. It was a person. El Dorado actually means the golden man. The Muisca would cover a sacrificial victim in gold dust and drop him into the centre of a lake to appease the gods. This show tells the golden man’s story, then branches out into an examination of the other uses of gold in the religious life of the Muisca. To ensure the coming of babies, the Muisca would leave tiny symbolic females fashioned from gold high up in the trees, where they were closer to the gods. Another way of getting close to the gods was to chew coca leaves and enter into hallucinogenic states. A holy Muisca would carry his coca around in a huge golden flask that makes Jay-Z’s medallions look like sixpences. What’s fascinating here is the value placed on the sophisticated religious meaning of gold. The Muisca worshipped gold for its cosmic significance, not its price. All that changed, of course, with the arrival of the Spaniards and their crude European greed. But the show reminds us splendidly of the original magic of gold. And how marvellous to see Colombia presented as a fountain of civilisation, rather than the cartel-torn cocaine hell they keep showing us on the news. Once again, the BM is making sense of the present by examining the past. Pearls, at the V&A, is worth visiting because of the sheer number of pearls on display. Beware: seeing this many at once may cause you to faint. But as an event, a journey, this curious exhibition feels surprisingly gloomy, chiefly because the pearls are so valuable, they need to be kept in tall metal safes that look like tombstones. It’s like a cemetery at twilight. Organised jointly with the Qatar Museums Authority, the show begins with a look back at the history of pearl fishing in the Gulf, then launches into a summary of the different types of pearl produced by different molluscs. The pearl produced by the horse conch is brown; that produced by the giant clam is beige. Scientifically, all are fascinating. Aesthetically, all are blown out of the water by the shimmering, translucent, ethereal beauty of the pearl produced by the oyster. A selection of historical portraits from around the world makes clear the international importance of pearls in art. And, as you peer into the heavy brown safes, you begin making exciting discoveries in the dark. That pearl earring was actually worn by Charles I when the Cromwellians beheaded him. That pearl necklace was given to Marilyn Monroe by her second husband, the baseball player Joe DiMaggio. 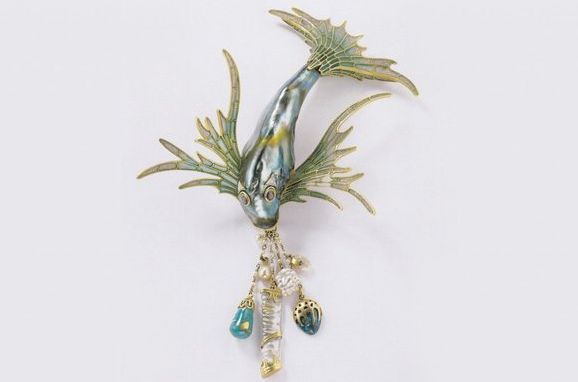 That new species of blue fish with the turquoise nuggets in its mouth isn’t a new species of fish at all, but a gorgeous bodice ornament fashioned from an abalone pearl in Paris in 1900. If I were giving the exhibition ticket as a present, however, I would choose the show with the emeralds in it. 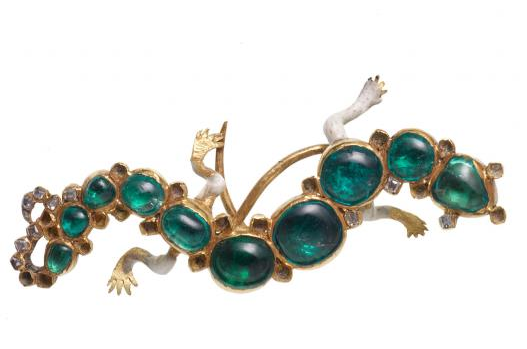 The Cheapside Hoard: London’s Lost Jewels, at the Museum of London, is such a delightful event. It commemorates the chance discovery in 1912 of a huge hoard of Tudor and Stuart bling by workmen digging up a basement in Cheapside. Nobody knows why or when this huge cache of jewels was hidden there, but it was some time before the Great Fire of London, in 1666. Preserved in the Cheapside Hoard is spectacular proof of the passion for bling in ye olde Englande. Rather than encase each jewel in its own safe, the Museum of London has placed a big metal gate across the front of the show, and allowed the contents to be airily and atmospherically displayed. My tongue lolled out soon after I stepped in, and stayed lolled out. Ye olde Englande, it turns out, was besotted with jewellery. The array of objects included here is dazzling — chains, pendants, rings, earrings, hairpieces. Once again, different types of bling were thought to have different magical properties, and were worn accordingly. In Shakespeare’s London, as in the ancient Andes, the citizens spoke to the gods in the language of jewels. There’s a particularly large emerald here, about the size of a roll of Sellotape, inside which some brilliant Stuart goldsmith has somehow inserted a delicate gold clock. “Dear God, if I promise never to be rude about Tate Britain again, or the Serpentine, or the Liverpool Biennale, can I please have that emerald clock for Christmas?